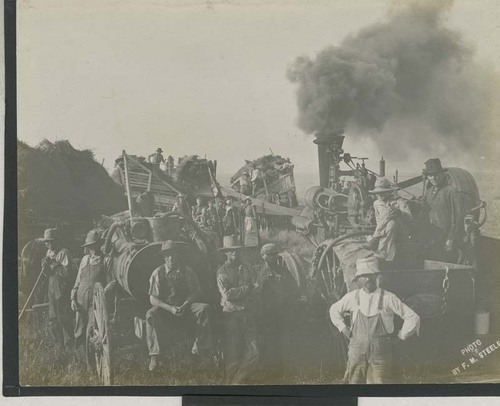 This is a view of a harvest crew pitching wheat bundles from the header barges into a thresher on the John Hutchinson ranch, three miles east of Satanta, Kansas, in Haskell County. The wheat was thrown into the thresher, where the grain and chaff were separated. The water wagon on the left provided water for the steam tractor, which powered the thresher. Rollie Wright is seen leaning on a pitchfork at the far left in the foreground.